The Four Season Survival Garden is part of a series of articles about how to deal with coming 'tough times', from the perspective of (what should be) our top priority - ensuring we have enough food. In most places in North America the 'eating season' is usually longer than the growing season; certainly this is true in my neck of the woods, near Ottawa Ontario latitude 45 north, zone 5. So, what's a survival gardener to do? Answer – plan a four season survival garden based on seasonal growing, storage and a small greenhouse. If you are already a serious gardener, then seasonal eating is nothing new. You know that not every veggie is available fresh all 12 months of the year. The other reality is, the more you try to thwart the natural seasonality of crops, the more work and energy (usually) is required. For example, around here harvesting tomatoes in July is easy, but gets progressively more energy-intensive as you move 'backward' in the calendar. But that energy doesn't necessarily have to be something you pay for through a meter. My small unheated greenhouse (actually a 20' x 30' poly covered hoophouse that's movable on rails, a la Eliot Coleman) gives me abundant free energy (heat and light) that make growing season extension much more practical and cost-efficient. And a basement cold room or a root cellar captures 'free cold' in the same way a greenhouse captures free heat. This combination makes providing your own food 12 months a year a much more practical option. But what about canning, drying and otherwise preserving food? They certainly have a place in assuring your food supply and providing variety in your diet, and I'll write more about that in upcoming articles. But, these methods also require more work and more energy than simple season extension and natural storage. Less work and less energy is a good thing, especially in parlous times. My own survival plans for 2012 include building a properly ventilated and insulated cold storage room (see more about that in Recommended Survival Resources below). When that's in place, here's how achieving 12 months of eating might work at New Terra Farm. Most years I can start working the ground in my hoophouse around the end of February, and I can plant early in March. 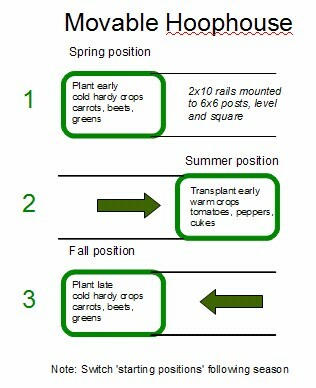 The first harvests – cold-hardy greens and salad makings are ready by mid-April. This is followed by turnips, beets and carrots. Beet and turnip thinnings contribute to salads or braised greens. I also start cole crops in March that will be transplanted to the outdoor garden in mid-April, where they can survive late frosts under row cover. The outdoor garden gets well underway in April, with both transplanted and direct-seeded cold-hardy crops. We replant greens, bunching onions, and radishes every week to 10 days or so. We replant turnips, carrots, broccoli and cabbage every two weeks. At about the same time, we move the hoophouse to 'summer position', so we can put the first transplants of tomato and peppers out. We give these an extra layer of protection by covering them with row cover. The remaining crops that were in the 'spring position' of the greenhouse can now survive with just row cover (see the Eliot Coleman books below for more info). Warm weather direct-seeded crops like beans and corn begin in June. Beans for drying are usually long season - 100+ days to maturity - so we start them early in the month. Harvesting from the outdoor gardens starts around end-May and continues through to October. The last plantings of storage crops from the outdoor garden are usually in July e.g. we plant potatoes for our winter supply around July 1. Obviously you want to delay the harvest as long as possible for your winter storage, without letting the crops get past peak maturity in the ground. We replant the open ground that was the 'spring position' of the greenhouse through July and August. These are the last plantings that we will eat fresh. Once the tomatoes, peppers, and cukes are finished (end-September or so) we move the greenhouse back to protect the carrots, turnips, beets, broccoli and cabbage and greens in the 'fall position'. We add a layer of row cover as the weather gets colder. We can keep eating fresh from this store until at least Christmas. 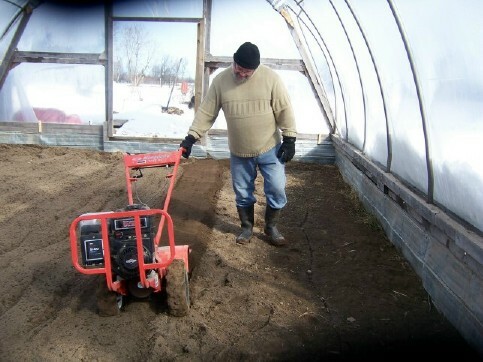 For the winter months, we will have a cold room full of potatoes, carrots, parsnips, rutabagas, onions, and garlic that will last until the first crops are ready again. If you have dried and stored beans and corn, you have a pretty substantial stock of survival food, even without considering canned food or small livestock (the topic of an upcoming article). Note: if you order one of these books using the links below, I receive a small commission. This does not affect the price of the book to you, but helps support this website, so I can keep delivering useful (hopefully!) and practical farming and gardening information. The Resilient Gardener, by Carol Deppe. This might be the single best reference for actually, practically growing a subsistence diet. Carol explains what to grow, how to grow, and how to store and use your home-grown survival food. She provides step by step instructions based on decades of experience. The New Organic Grower, by Eliot Coleman. This has been my organic farming 'bible' for many years. Eliot call this book a 'Master's Manual of Tools and Techniques for the Home and Market Gardener', and that description is exactly right. The Winter Harvest Handbook, by Eliot Coleman. If you want to learn how to manage a cool greenhouse as a home or market grower, this is the essential reference. The Complete Vegetable and Herb Gardener, by Karan Davis Cutler. This book provided me invaluable information when I was first developing my Bootstrap Garden Planner. It is probably the single best reference I own about how to grow specific crops, and the appropriate quantities to plan for. Ms. Cutler discusses sites, soils, plant starting, transplanting, harvesting, and plant diseases and pests. If you could buy only one gardening book as a market gardener, I would recommend this one. Root Cellaring, Natural Cold Storage of Fruits & vegetables, by Mike and Nancy Bubel. Chockfull of piratical advice on growing, harvesting and storing food, along with plans to build cold storage for just about anyone (here's where I got the idea for my basement cold room mentioned above). Nourishing Traditions, by Sally Fallon. You might be surprised that I'm including a cookbook in my recommendations, but this book goes far beyond recipes to demonstrate what's wrong with our current model of supplying food, and how to fix it. Of the almost one hundred cookbooks I own, this is my number one choice. Got some ideas, questions, comments about the upcoming end of BAU? Got a topic you would like me to expand on? Share it here.